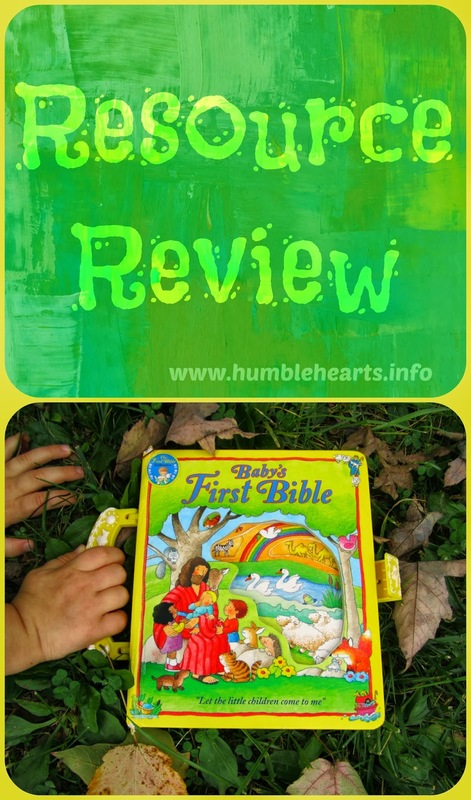 Resource Review: "Baby's First Bible"
I have enjoyed so many sweet moments with one of my daughters curled up on my lap reading "Baby's First Bible" by Colin and Moira MacLean. We have used this Bible since our first daughter was a baby. Our first copy was from a consignment sale. It became so "well loved" (aka: falling a part) that we are now on our second copy! When deciding on a board book Bible my husband and I wanted it to mention a part of the gospel, including the resurrection. We have been happy with how this book has provided moments to start teaching about Who God is and about His son Jesus Christ. One thing I love about this book is how it engaged my little one's attention through the pictures. The illustrations are brightly colored with round faces that babies are drawn to. Once it had my daughter's attention then I could have moments to start to teach her about God. On every page there are lots of animals. I find this amusing, because I don't think there were quite so many frolicking foxes, dogs, birds and cats during the actual events! But the animals in the pictures helped to initially engage my daughter to look and listen. From there, she started to take in some of the content on the page. The book has simple text that often rhymes. The content starts to expose the child to the Bible record. For example "God raised Jesus from the dead. "My Lord's alive!" Mary said." Each page is concise enough that when my daughter had a short attention span we could just do a page or two and still be profitable. This Bible touches on Adam and Eve, Noah, baby Moses, David as a shepherd, Daniel with the lions, baby Jesus, Jesus at 12 years old, Zacchaeus, Jesus calming the storm, and the resurrection. It illustrates Deuteronomy 6:5, Psalms 47:1, and Mark 10:14. With any resource I am always looking to see if the resource says what the Bible says. For the angels talking to the shepherds it has "angels sang praises" when in the Bible they "said" praises. I find this easy enough to change the wording when reading to my child. Sometimes my daughter's attention span would last for a page or two, and other times we would read the whole book from front to back. Often when reading this book we end up singing songs related to the page such as My God is So Great, Noah's Ark, Daniel Was a Man of Prayer, Zacchaeus, and He Arose chorus. We even made up our own tune with clapping for Psalm 47:1. We also played "pointing" games. I would ask my daughter to point to David, point to the sheep, etc. Then other times my daughter would love to point to different things on the page for me to name what they where. 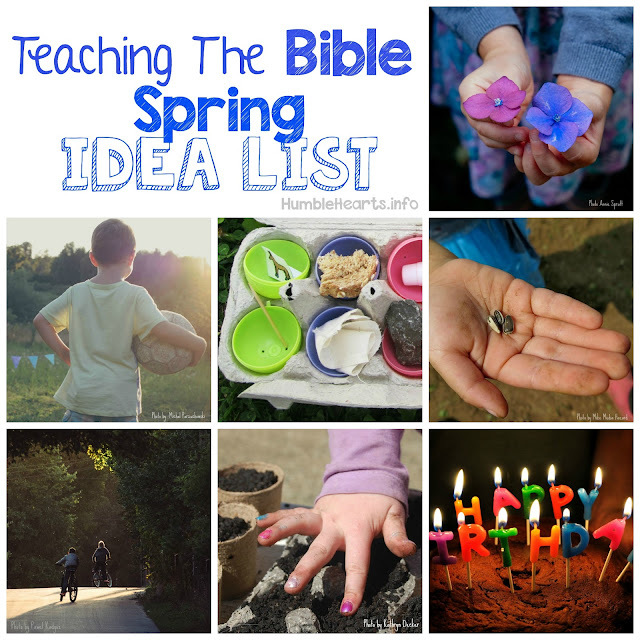 These where wonderful chances for her to start to build vocabulary related to the Bible. Having the vocabulary, she now has been ready as she starts to become old enough to understand parts of Biblical records. This board book Bible has engaging pictures, simple but accurate words, and is a wonderful starting point for teaching your child the Bible. It is a great book for babies, toddlers and preschoolers. You can look at a preview of the pages at Amazon and Christianbook.